A former Cameron Parish ambulance district director and employees at a Jennings accounting firm are accused of embezzling almost $400,000, according to court documents. A civil suit petition states that Stephen Kershaw, while serving as director of Cameron Parish Ambulance District 2, conspired with April Ebarb, Betty Bealer and Brittany Durio, all of Jennings and employees at Arthur D. Matte’s accounting firm, to falsely issue checks to themselves. The activities were covered up by changing the names on the checks in the accounting software, according to court documents. Kershaw reportedly pocketed $202,490.21 between 2005 and 2010. Matte’s accounting firm was tasked with handling payroll, taxes and bills incurred by the ambulance district, which covers the Hackberry area. The investigation began in 2010, during which FBI agents seized the district’s financial records. According to records, Kershaw’s attorneys stated that he was pressured to go along with the scheme by Matte’s employees. When Kershaw said he would report the fraud, April Ebarb reportedly threatened to tell the board of directors about the manipulation of checks. Officials are asking for the accused to pay back the allegedly embezzled money and all legal fees. The one-mile stretch of Railroad Avenue that ends at North Ryan Street is a quiet area with, for the most part, grass-filled lots and a few unassuming businesses. 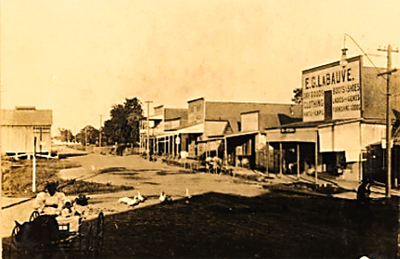 During Lake Charles’ first big population explosion in the 1880s, that area served as the business and residential hub of the town. Lake Charles developed around the lumber and shipping industries, and when the Southern Pacific and Kansas City, Watkins and Gulf railroads were built in the 1890s, the rail became the main mode of transportation for goods and people. In those eight blocks, there was a depot for passengers headed to all parts of the still expanding United States, cafes, grocery and drug stores, theaters and meat and fish markets, according to an Oct. 1981 article in Today’s World magazine. The businesses served locals whose neighborhoods fanned out from the strip and passengers passing through on trains. The Central Food Market, owned by the Banano family, served as a business and home for the large family. Its large balcony was the best place to watch the circus unloading its equipment and animals. “The train cars would be parked for blocks as kids and grown-ups watched the unloading,” the article says. There was also a baseball park just south Railroad Avenue, where Babe Ruth played during a 1921 exhibition game between the New York Yankees and St. Louis Cardinals. In its heyday, the bustling business hub of Railroad Avenue had its seedy side, which attracted lumbermen and railroad workers in the area. “Battle Row” was the nicer name for Lake Charles’ red light district, which was just south of the Southern Pacific railroad depot and ran from Kirkman to Reid streets. Throughout the 1880s and early 1900s, temperance groups lobbied politicians to ban the gambling parlors and saloons, according to a Nov. 1972 American Press article. Resolutions to “abolish houses of ill repute” were repeatedly voted down. The rumor was that the women of the houses knew too much. In 1903, the City Council raised the cost of liquor licenses from $200 to $1,000, but 25 licenses were issued in one day. That year, police recorded 92 arrests in one month for disorderly conduct, fighting or drunkenness and 102 similar arrests the next month. As long as there was a demand, there was a supply. Around the late 1950s, the main thoroughfare shifted to Ryan Street downtown. The neighborhoods around Railroad Avenue that had been mixed for almost 100 years, saw heavy white flight. Among those leaving were businesses owned by many Italian-American families. The ACTS (Artists Civic Theater and Studio) was refurbished in the 1980s and still performs live stage plays and the Amtrak station serves local passengers at Railroad Avenue and North Ryan Street. No other commercial businesses, such as convenience stores or restaurants, are along the avenue. Whooping Cranes release from Vanessa Deggins on Vimeo. A group of rare birds is settling in to life in Southwest Louisiana. Ten juvenile whooping cranes have been introduced to the White Lake Conservation Area in Vermilion Parish by state and federal wildlife officials. The site was selected for the 10-year project because of the state’s successes with species-restoration projects involving the American alligator and brown pelican. On Tuesday, local media were allowed to observe the birds. The cranes came from a U.S. Geological Survey research facility in Maryland, where they were “costume-reared” by workers who covered their bodies and fed the birds using fake beaks. For their first two weeks at White Lake, the cranes will be in a 70-foot diameter wire mesh cage surrounded by an electric fence. When the cage is removed, the birds, who have GPS trackers, will continue to be fed by workers in bird costumes. Biologists will check for any indications of disease and monitor their social behavior. The three males and seven females are each about 10 months old, according to state wildlife biologist Carrie Salyers. They begin to mate at between 3 and 5 years old. Salyers said the wildlife agencies hope to release more cranes in the fall. “This is one of the most complex projects I have worked on,” said state biologist Tom Hess. Hess, who worked on the alligator and pelican projects, said his department had to convince landowners and people with agricultural and oil interests in the area that the re-entry program would not affect their daily lives. Hess said the long-term goal of the program is to establish a permanent, self-sustaining population of whooping cranes with 130-150 adult birds and at least 30 nesting pairs that will breed for at least 10 years. Whooping cranes were present on Southwest Louisiana’s chenier coastal plain until the 1940s, according to wildlife officials. By the late 1950s, much of their habitat was converted to agricultural land, and the birds were subjected to unrestricted hunting. North Lake Charles is now made up of a set of relatively quiet neighborhoods. But in earlier days, it served as one of the most progressive areas, both ethnically and in commerce, in the state. Here is the history of a few of the communities. The neighborhood of Goosport in north Lake Charles — now predominately black — has a long history as viewed through American Press archives. The area is named after Capt. Daniel J. Goos, who came to Lake Charles in 1855 from Fohr Island in Germany after stops in New Orleans and Biloxi, Miss. The area is between Railroad Avenue on the south, Fitzenreiter Road on the north, U.S. 171 on the east and the Calcasieu River on the west. Goosport was a racially mixed area up until the 1950s. Its residents were mostly African Americans and Italians Americans, according to American Press archives. Between 1900 and 1930, many immigrants from western Sicily came to Lake Charles and had small farms or were seasonal agriculture workers, according to McNeese State University’s Mediterranean Oral History Project. 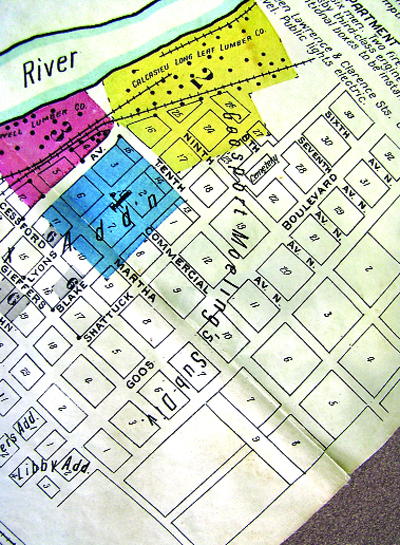 A 1909 insurance map lists the area as the “Goosport Moeling subdivision,” named after Daniel Goos and his wife, the former Katherina Moeling, whom he married in New Orleans. Throughout segregation, schools and other public places were subject to laws that separated the races, but Goosport remained a mixed neighborhood. Frank Pryce, who owned a pharmacy in the area, was quoted saying “everyone got along like one big family,” in a 2003 news article. There is no documentation of the area being officially named Goosport, but the term is used throughout the American Press archives as far back as the 1920s. Daniel Johannes Goos made his name in Lake Charles in shipping and lumber. When he came to Lake Charles in 1855, he set up two sawmills to supplement a lumber shipping business he had started in Biloxi. He also built a shipyard, which he operated until 1884. The origin of the name could not be traced to a single person, but American Press and McNeese State University archives note that the neighborhood was named after a group of 11 Fisher families who came to Lake Charles. Among the prominent Fishers found in American Press archives is C.W. Fisher, who came to Lake Charles in 1883 from Wichita, Kan. He was among the businessmen who came down from the Midwest and over from Georgia and Mississippi who made Southwest Louisiana a lumber empire during the late 1800s and early 1900s. The boundaries of Fisherville are Shattuck Street on the west, Broad Street on the south, U.S. 171 on the east and Railroad Avenue on the north. It followed Goosport with diverse demographics consisting of African Americans and immigrants from Sicily, Lebanon and Syria, according to an Oct. 1, 1985, article in Today’s World magazine. The term served as a nickname for the area along the Calcasieu River near North Kirkman Street where the Lake Charles Rice Milling company once stood. Many residents of Goosport and Fisherville worked at the mill. The first mill was built in 1892 on 40 acres along the river. It was the largest rice mill in the country, according to American Press archives. The location between the Calcasieu River and Southern Pacific Railroad, which connected with other railroad companies, provided quick transportation of goods to most parts of the country. With the cash system, Lake Charles Milling Company purchased the rice directly from the farmers and sold the finished product in bulk. “In those days, the rice that came out of the mill set the price for that commodity in the U.S.,” said Adley Cormier, who is with the Calcasieu Preservation Society. Cormier said he found the information in the 1913 Department of Agriculture yearbook. After a 1924 fire razed the property, the mill was rebuilt to twice it’s original size, making it the largest rice mill in the world. By the time it was modernized and completed in 1926, the city had dredged the ship channel, making shipments to anywhere in the world much easier. A state lawmaker is suggesting an alternate location for a federal halfway house that has been proposed for residential areas in Lake Charles. Community Transitional Services of Louisville, Ky., which has a contract to build the facility, has faced opposition from residents and city officials in regards to two sites — one at Cline and Emerald streets near J.J. Johnson Elementary School and the other on the 1800 block of Broad Street near Reynaud Middle School. State Rep. A. B. Franklin is suggesting the Lacassine location of the Academy of Life Skills. In 2006, Jeff Davis Parish officials were opposed to the academy’s location, citing it’s proximity to residences and Lacassine High School. Lee Mallett with the Academy said he chose Lacassine because he wanted to keep it away from more-heavily populated areas. “Studies show (the homes) don’t hurt residents, but there is always an uproar,” Mallett said. Franklin said he made multiple inquiries to the federal government to suggest the Lacassine location and got no response. Mallett said he reached out to the contractor, offering to work with them. “We have 20 acres, and we’re accredited (by the Department of Corrections and American Correctional Association),” Mallett said. Repeated calls to Community Transitional Services and the Bureau of Prisons requesting criteria for site selection were not returned. Calcasieu Parish census data show that Iowa grew by 11 percent over the last decade, while DeQuincy’s population dropped by about 5 percent. Other cities that lost residents include Sulphur, with a 0.5 percent decrease; Vinton, a 3.8 percent decrease; and Westlake, a 2.1 percent decrease. Besides Iowa, Lake Charles was the only parish city that experienced growth — the population rose from 71,757 in 2000 to 71,993 in 2010. Iowa’s population grew by 11.1 percent over the last 10 years. The census reported 2,996 people in 2010 — 333 more than in 2000. Mayor Carol Ponthieux said she was “thrilled to see those kind of numbers.” She said the growth could result from people who work in Lake Charles moving to Iowa. Lake Charles Mayor Randy Roach said last week he was disappointed with the city’s small population increase. Westlake Mayor Dan Cupit said the loss of about 100 residents, or 2.1 percent of the population, isn’t that significant, but is a bit of a surprise. “I thought we would have more people than in 2000 because of the houses that have been built over the years,” he said. Cupit said he expects the population to increase in the future as more people move to the area because of Westlake’s new golf course. According to Cupit, the Louisiana Municipal Association has received notice from some cities who were unhappy with their numbers and plan to appeal the results. He said Westlake won’t. “With that amount, we don’t stand to gain or lose anything,” Cupit said. DeQuincy Mayor Lawrence Henagan thinks the city’s population decrease of 4.8 percent, or 163 people, is because people are building outside the city limits. “They still have DeQuincy addresses, but they aren’t counted in the incorporated area,” he said. Vinton Mayor Kenny Stinson wasn’t phased by his city’s decrease of 3.8 percent, or 126 people. Mayor Chris Duncan was also surprised at Sulphur’s 0.5 percent decrease of 102 people. The census numbers from each district will be a better gauge of the actual population numbers, he said. Staff Writers John Guidroz, Todd Elliott, Vanessa C. Deggins and Taylor Prejean contributed to this report. Wildlife officials have controlled burns planned for almost 60,000 acres of marsh in the Sabine National Wildlife Refuge this month. The refuge, established in 1937, includes more than 124,000 acres of marshland. A burn is a common tool used to get rid of dead vegetation that fuels wildfires and slows germination and growth of new plants, said refuge official Diane Borden-Billiot. She said the burns also help control invasive species, such as the Chinese tallow tree. There is no set time for the burns, which will be in five areas. “Each area burn will be different. It mainly depends on what the (U.S. Fish and Wildlife) agents need to protect,” Bordon-Billiot said. Weather conditions dictate when they are held. The presence of northerly winds is a plus, Bordon-Billiot said. Such winds are expected Thursday or Friday. “We don’t want to smoke out the closest community, which is Johnson Bayou. So we want to make sure that smoke goes out over the Gulf,” she said. The largest burn will be in Unit 3 in the north-central part of the refuge. Its smoke column should be visible from La. 27, Bordon-Billiot said. She said controlled burns in some parts of the refuge have not taken place since before Hurricane Rita struck in 2005. “Our goal is to do each unit on a three-year rotation, but sometimes budgetary and administrative constraints get in the way,” Bordon-Billiot said. The burns will require up to 10 people to be on duty. Included will be helicopter pilots and personnel to operate other equipment, such as a fire engine and outboard boats.